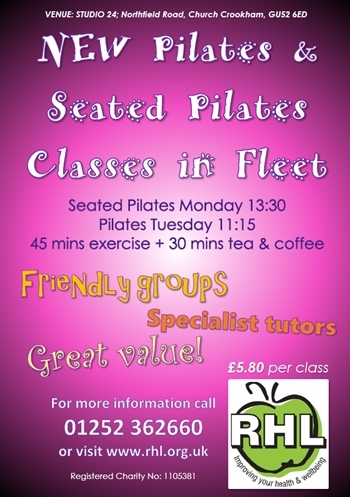 "Pilates was suggested by my Osteopath last year for a lower back problem. Instead of a visit to him every 2 weeks it is now 2 months. He has told me to keep it up." Pilates is a form of body conditioning which focuses on the core postural muscles which help to keep the body balanced, and which are essential to providing support for the spine. This type of exercise was developed by Joseph Pilates in the early twentieth century to teach awareness of breath and alignment of the spine, and to strengthen the deep torso muscles. This particularly improves core abdominal strength but it also effectively tones and stretches all areas of the body. Because of its focus on the spine, Pilates can be beneficial for people with back problems, but please seek advice from your GP before joining the class if this applies to you. The class lasts an hour and includes floor work as well as exercises performed standing. The moves are performed in a very controlled way, and, although Pilates is not an aerobic workout that raises the heart rate, the muscles of the body are worked very effectively. Correct breathing is an important focus in Pilates, and breathing instructions are explained with every exercise as well as movement instructions. You pay careful attention to your body, building on very small, delicate fundamental movements and controlled breathing. There is a relaxation section at the end of the class. "It's really great. Jo [the tutor] is perfect for this class which is lively & great fun - laughter is the best medicine. I’m extremely impressed with this programme & hope you can continue to expand." You should wear comfortable clothes that do not restrict your movement. You will be lying on the floor for many of the exercises, so skirts are not suitable. It is preferable to do the class barefoot. You may keep your socks on if you prefer, but it is not advisable to wear shoes. You may wish to bring a sweatshirt or jumper to wear at the beginning and end of the class, particularly during colder weather. You should bring an exercise mat if you have one, or a thick blanket or towel to lie on. You may also want to bring a bottle of water with you.